Don't settle for poor performing sealed beams. Easily convert to high performance Bulb-Type headlights now. ORDER a SealedBeam Conversion Kit NOW! Click to see our 4351/4352 and 4703/4701 Conversion Headlights. EuroLamps for most vehicles are just a simple bulb replacement. However, some vehicles use sealed beam lighting which requires that you convert to bulb type lighting. For these applications we offer EuroLamps SealedBeam Conversions. Which offer MUCH better lighting and once installed allows you to change bulbs very easily. While imitation conversion kits use low quality materials and poorly designed lenses. EuroLamps Sealed Beam Conversion kits use All-Glass lenses with True European Beam patterns for Maximum performance & output. We offer conversions for 99% of all sealed beam applications which means we very likely have a conversion for your vehicle. If you are unsure whether you need Sealed Beam Conversions, email us with your vehicle make/model/year. EuroLamps(tm) SealedBeam Conversion kits come with everything you need to convert from sealed beams to EuroLamps. Below are photos of our more common conversion kits we offer MANY other models, including hard to find kits. To order or for more info: EMAIL us or go to our Form. If you know exactly which kit your vehicle needs. Please use the buttons below to ORDER NOW. Doubts or questions about which units your vehicle requires? Unsure whether or not your vehicle even requires a Sealed Beam Conversion? EMAIL us or go to our Form. We will answer ALL your questions very quickly. Usually within hours! 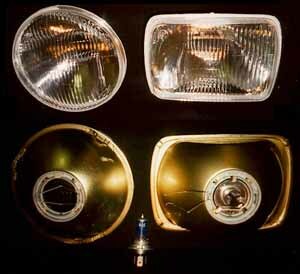 Below are the more common sealed beam conversion kits. We offer MANY others. If you do not see yours below EMAIL us or go to our Form. All Prices below are Per Complete Kit. Everything needed to convert your Left and Right headlights. FREE Shipping is included!